Children are often taught the story of Jacob’s Ladder; the vision that Jacob saw when he was sleeping in the place he named Bethel. I wonder if anyone ever teaches that this is a Messianic prophecy? We see that Jacob, like his father and grandfather, received a promise from God for his descendants. But what about the part about the ladder with the angels going up and down. 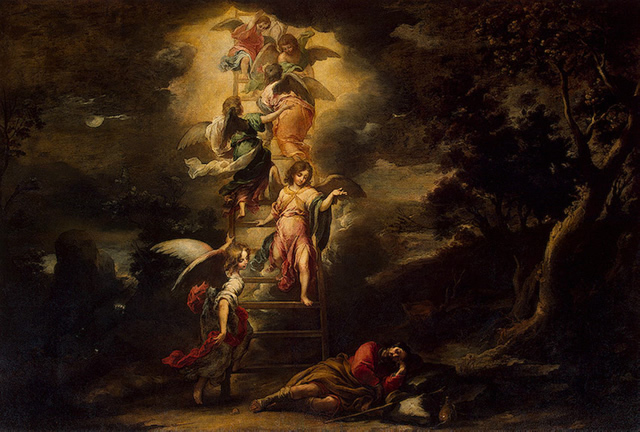 Did you know that the Messiah IS Jacob’s Ladder? Not one of the angels but THE LADDER. What??? Find out from his own words, first when he met Nathaniel and told him that he would see the angels of God ascending and descending upon the Son of Man. In John chapter 10 Jesus said that he was the door, or gate, for the sheep. The way, the entrance to heaven is through the Son of God, Jesus Christ and that is the meaning of the prophetic vision given to Jacob that through his seed, the Messiah, all nations would be blessed. He is The Gate of Heaven and all who believe are welcome to enter in. Yesterday we read about the curse in Genesis 3:15. But as one of the verses written by Isaac Watts in 1719 says, “No more let sins and sorrows grow, nor thorns infest the ground. He comes to make his blessings flow far as the curse is found.” Yes!